Peter Brötzmann, tenor and baritone saxophones; Willem Breuker, tenor saxophone, bass clarinet; Evan Parker, tenor saxophone; Gerd Dudek, tenor saxophone (track 6 only); Fred Van Hove, piano; Peter Kowald, bass, Buschi Niebergall, bass; Han Bennink, drums; Sven-Åke Johansson, drums. Tracks 1-5 recorded May 1968 at Lila Eule in Bremen; track 6 recorded on 24 March 1968 live at the Frankfurt Jazz Festival. 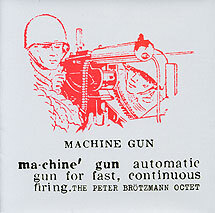 Original design (front cover repoduced above) by Brötzmann.